So you’ve decided to take music production as a hobby (or a serious venture) and build a home recording studio. Everyone starts building something with a budget in mind – including a home recording studio. What equipments should I spend more money on? Which stuff can I get cheap on? Back then, I started out as a music arranger, with just a MIDI controller, an M-Audio audio interface and a laptop. Eventually, I built a home recording studio and begin investing in more equipments like microphones, studio monitors and mixing consoles. In this post, I’ll explain what you’ll really need to get started. 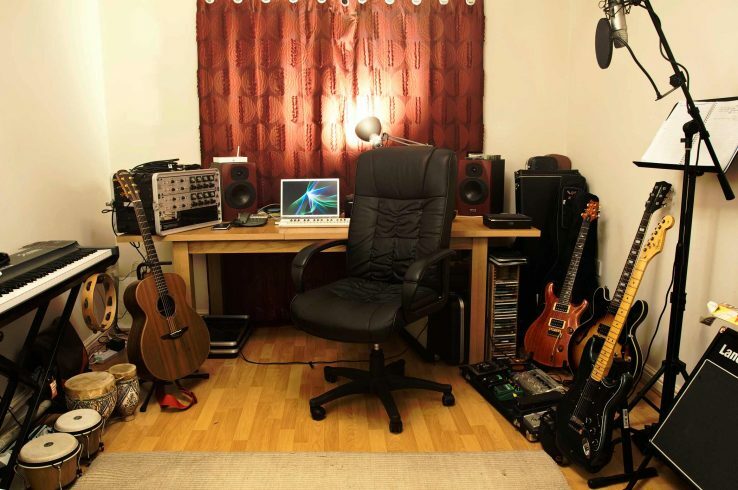 Where you can save money on and what to look out for when building your home recording studio. 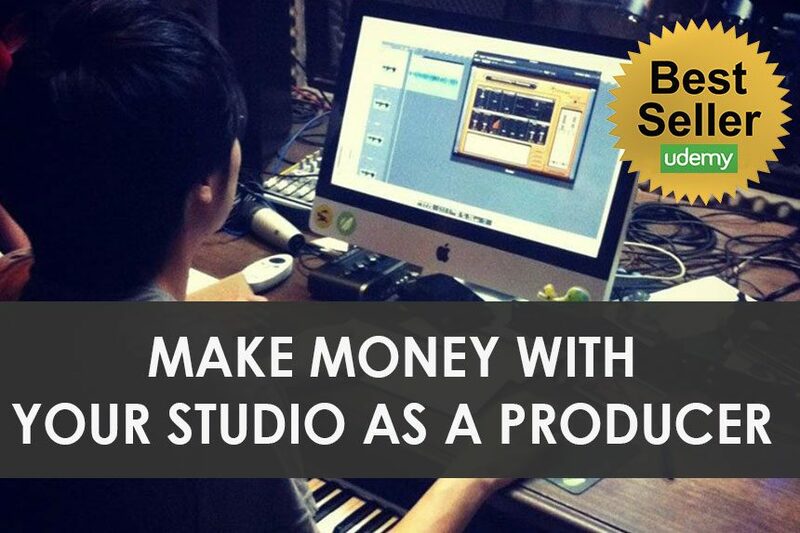 Lucky for you, it’s now more affordable than ever to get into music production and recording. Let’s get started. If you’re a music producer, it’s easy to get GAS (Gear-Acquisition Syndrome). Every recording gear you see at the store, promises that you’ll make better music. Trust me – even the most seasoned music producers buy music gear with their emotions, not their brains. You don’t want to fall into that trap! Don’t fly off the handle and buy the best state-of-the-art, top-end home studio suite. As you go deeper into the art, you’ll begin to find out where your producing tastes lie and how you like to do things. For example, some music producers prefer using a keyboard MIDI controller to program music and others prefer using a pad-based MIDI controller. It’s best to start simple. This doesn’t mean that you shouldn’t but a complete recording studio kit. You can, but you should really know your producing style first. However, you still need certain equipments to start your recording studio. Here are seven home recording studio essentials that will get you started and I’ll explain every one. Don’t care what people tell you. If you’re a modern music producer living in the 20th century, your computer is going to be the heart of the studio. Sorry, but don’t expect to produce better music than the rest of the world, if you’re going fully analogue. 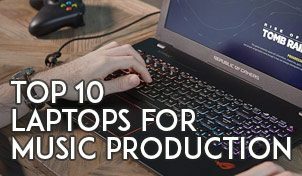 You don’t need the best computer to make good music, but you can get huge performance boosts—and spend a lot less time waiting around for things to load—by making a few strategic computer upgrades. First, max out your computer’s RAM. Most digital audio workstations (DAW), their effects and plugins are RAM hoarders. The more RAM you have on your computer systems means you can run your music arrangement with more effects & plugins on them. Next, choose an SSD drive as your main drive, where you install your DAW and plugins. Store your samples & projects in a bigger hard disk drive. The SSD drive is going to cost you a lot more than if you were to go with a regular spinning drive, but trust me – having a SSD as your main drive, will take you a long way. I’ve met countless of students who thought their computer was too slow, only to realize that the main culprit was the hard disk drive. The Samsung 860 EVO is one of the best SSD for music production. SSDs are worth the money! Having a fast disk drive means files transfer faster to & fro the hard drive – think about when you record & playback large amount of tracks. You will experience fewer disk overloads when recording or playing back on your DAW with a faster drive. A certain amount of CPU power and disk drive I/O are needed when you playback. Lastly, the next important component thing to look for in a computer for music production is the CPU. Of course, if you have the budget, get the fastest CPU you can afford – eventually prolonging the usability of your computer to produce music. However, if budget is a concern, a general thumb of rule is to get at least an i5 processor. Remember, the biggest bottleneck for most music production laptop or desktop is usually the hard disk drive. You can save your money on the other components, which won’t affect your producing experience, like the graphics card or sound card. Like to learn more? Read our guide to choosing a computer for music production here. A DAW is just a pretty name for the music software you use on your computer. Depending on the computer OS you choose to go for, your choice for your main DAW might be different. Most newbies will start Googling to see what their music producer heroes use to produce music, then buy that same software. WRONG. That’s, in fact, one of the worst ways to settle down for a software. Instead, take the time to download the trial versions of each DAW and take it for a spin. Also most DAWs offer the same sound quality. There are going to be people who tell you things like, “oh, the sound exported on Logic Pro sounds thinner!” or “Cubase has an algorithm that bounces fatter sounding audio”. Oh yeah? Do a double blind test on these critiques and I bet they’ll never be able to tell the difference of the DAW software used. What’s different though, is the plugins, VSTs and most importantly, the workflow of the particular DAW. Some DAWs (like Cubase) offer more flexibility in MIDI editing and some DAWs (like Ableton) offer better flexibility in tweaking sounds & effects. So the best way to know which DAW suits your workflow and style – is to really try them out. To help you make a decision, I’ll briefly explain the strengths, weakness of a few popular DAWs and the type of producer that should get it. I won’t though, cover every DAW in this post – that’s reserved for another post on DAWs. Logic Pro is the DAW I started producing music on and till today, I still believe it’s one of the best DAWs to get started on if you’re starting out. Why? Because Logic comes with everything you need to start composing your first scratch track to mastering your final mix. There are a plenty of loops, instrument samples, editing tools and not to mention the world-class audio effects – all comes installed with a copy of Logic. You don’t even need a dongle to use Logic. The biggest drawback to Logic is that it only runs on Mac. 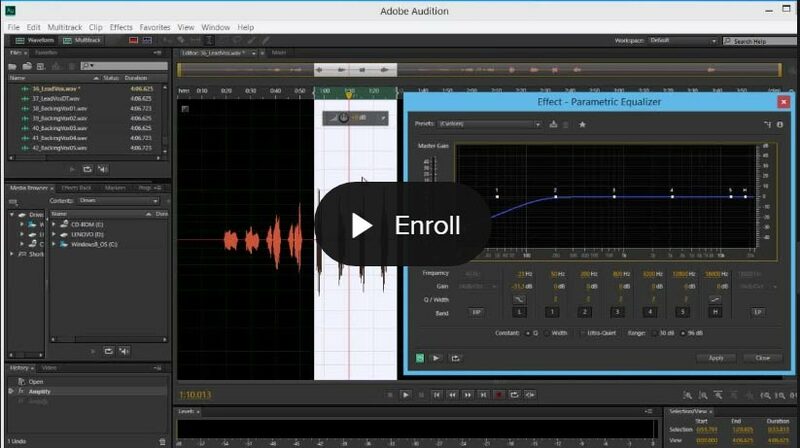 Secondly, Logic Pro is not made as an audio editor, so for audio editing edits, you might want to get a dedicated audio editor like Adobe Auditon. Film scorers, electronic musicians, singer-songwriters and even guitarists – would love Logic Pro. It has everything out of the box for the music producer. Preferred by most electronic music producers, why, some producers actually make music on Ableton without the need for a MIDI controller. Ableton is a loop-based DAW with an efficient layout and effects racks, making it easy for an EDM producer to tweak & edit sounds on the go. Laying out ideas and programming automation on Ableton is a whole lot faster too. Ableton though lacks the functions that are needed from a film music producer. Ableton is favored by electronic musicians and DJs. FL Studio is also more suited for electronic music making and is often favored by electronic musicians as it comes with a lot of great VSTs, effects and mixing environment, made for electronic music. More of a MIDI-based DAW, you can literally create music with mouse clicks on FL Studio. What it lacks is better audio recording/editing support, it being a CPU resource hog and FL Studio only runs on PC. Great for electronic musicians. Those without a formal music background might like FL Studio better. Pro Tools is seen as the classic, industry standard to music production. You’ll find Pro Tools in most universities and commercial recording studios. Its tools are normally used for post-production work – mixing, mastering and handling broadcast audio. Where it falls short is probably MIDI editing and tweaking. If you’re doing film scoring, sound design or mastering, Pro Tools is perfect. If you’re into producing hip-hop music, recording & arranging a pop song, perhaps go for the other DAWs. Another thing to note is that Pro Tools has a subscription plan, which might appeal to you if you rather pay monthly rather upfronting a sum for a DAW. Wait, what about other DAWs like Cubase or Reason? Read our article on the best DAWs for music production. I often find most beginners have biggest doubts about choosing an audio interface. Simply because there is too many audio interfaces in the market! Sadly, there’s no one size fits it all audio interface, but knowing your style of music production, will bring you closer to the type of audio interface you should buy. 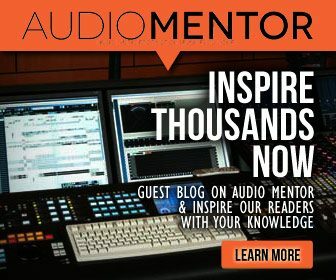 What does an audio interface really do? An audio interface is like an external sound card, that allows you to record audio from analog instruments, like the guitar or keyboard. It also allows you to output sounds from your computer to external mixers or studio monitors. Most audio interfaces come with inbuilt microphone pre-amps and some come added with a MIDI interface. There are a few key factors in audio interfaces that might favour you, compared to another fellow music producer. But I’ll explain the few important aspects of choosing an audio interface. It’s nice to have more inputs/outputs than you need. This widens your recording possibilities. Generally, I’d advise you to get as many input and outputs as possible. More inputs on your audio interface mean you can use it for more recording situations. Recording a single vocalist, sure. Recording an 8 track band? No problem if you have the inputs. 2 outputs are standard for an audio interface, but if you see yourself doing audio surround mixing work or DJ-ing, you might want to get an interface with at least 6 output channels. Unless you are planning to use a dedicated microphone pre-amp, you are probably going to do most of your recordings through the onboard pre-amps on your audio interface. Most audio interface comes with decent-sounding preamps, but some come built with higher quality audio components – so they sound better, have less self-noise and have more gain. The quality of audio components in the audio interface is also one of the reason why audio interface differ in price, besides the brand. If you like an audio interface that comes with good pre-amps, without breaking the bank, here are few brands that a worth considering: Focusrite, Audient & Apogee. If you’re on a budget, I recommend getting a USB audio interface. While USB is the slowest among the other types of connection, it’s also most versatile – and you can use that same audio interface on different computers systems and keep it for the years to come. Firewire is becoming less popular although you’ll find them in more expensive and commercial studios. Thunderbolt is kind of the semi-pro connection, between USB and Firewire, but getting a Thunderbolt audio interface seriously limits you to the type of computer systems you can use it on. PCIe audio interfaces are those soundcards that you stick into a motherboard of your tower CPU. They are becoming quite rare these days and is only used by professional studios. The plus side of PCIe audio interfaces is that they offer the lowest latency, compared to any of the other connection types. Do your audio interface manufacturer provide constant driver updates? Nobody rarely gives you advice for this, but I felt it should. When buying an audio interface, make sure to buy from a brand who constantly listens to their customers and update the drivers. Computers OS and DAW softwares are constantly being updated. And if your audio interface does not have an updated driver, you’re going to have a huge headache. Read our complete guide to choosing an audio interface. If you’re on a tight budget, start off your producing career with studio headphones. There’s nothing wrong with using headphones to record, compose and produce music. Besides if you work with audio, you’ll find the headphone to be an indispensable tool in the studio. The only not-so-ideal situation comes during the process of mixing and mastering your track for commercial playback. The AKG 240 is an affordable semi-open for starters. As it names suggest, semi-open or open-back headphones are headphones that have holes or an exposed back – causing more sound to leak from the headphones. This means people around can hear what you’re listening to. Open-back headphones normally offer more accurate treble and mid sound playback. They also have a wider soundstage which makes it ideal for editing and mixing work. Most headphones are closed-back, where they have a solid enclosure, preventing sound from escaping the cups. Some manufacturers call this ‘isolation’ headphones. If you do lots of headphone listening, you’ll find that closed-back headphones often have more bass. Closed-back headphones are preferred for recording work, as it minimizes audio leakage from the cups to the microphone. When buying studio monitors for your home studio, I advise getting at a minimum, one with a 6-inch woofer. Smaller studio monitors are often not able to give you an accurate bass sound reproduction. Studio monitor manufacturers usually promote their speakers by patching the word ‘flat-response’. But don’t believe them! Every studio monitor speaker has it own sound characteristics and they will sound different again, depending on the room they are placed in. So what do you do? Choose a studio monitor by playing back your favourite music track at the audio store, and select by careful listening rather than price. 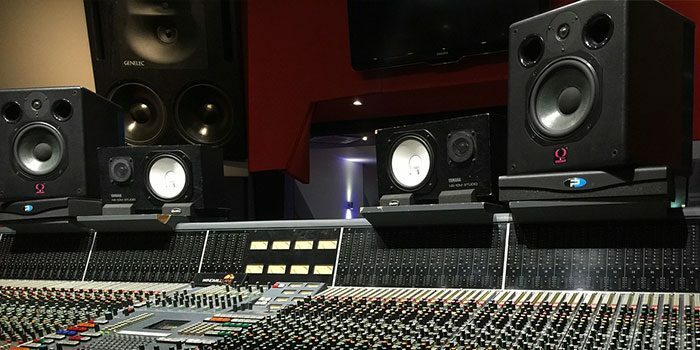 Read our guide on studio monitor placement tips to learn more. Alright, we’re getting there in completing your home studio. Next up microphones. Always see microphone purchasing as an ‘investment’ rather than a normal purchase. Good microphones literally last forever and although I doubt you’ll sell any of your microphones, you can actually resell them at pretty fair prices. Choose microphones that you know you will use again and again. Avoid buying cheap microphones, just because you think it’s ‘okay’ to try something cheap or different. For beginners, I recommend starting with a condenser microphone. 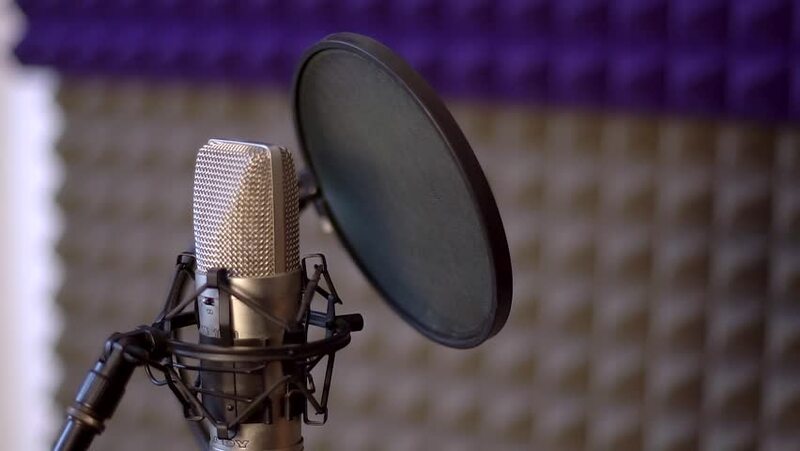 If you’ve not recorded on a microphone before, you’ll learn the fastest when trying to record with a condenser microphone. Because they are so sensitive (they even record the sound of your CPU whirring away), you’ll find yourself experimenting more with mic placements and recording techniques – which is what you want as an aspiring record producer. Also, a condenser microphone is most versatile. You can use it for vocals, voice-overs, recording acoustic instruments and even drums – with a single condenser mic. What’s important is really microphone techniques. Once you outlearn your condenser microphone (you will), then its’ time to explore more microphone types. This is where most music producers start collecting more microphones from dynamic to ribbon microphones, each with their own unique character to take on different instrument recordings. The question almost everyone asks then comes. Hey, shouldn’t a ‘recording studio’ need some sort of mixer sitting on the desk? The truth is other than having a mixer to make your home recording studio look more like a ‘studio’, you don’t really need a mixer – at least when you are starting out. Of course, a mixer would help in routing audio signals around in your home studio, but if you’re a one-man producer, you probably don’t need it. To know whether you need a mixer or not, let’s first understand what a mixer really does. The job of an audio mixer is to route audio. It takes one and more audio signals, combines them and then provides outputs for the signals. An audio engineer could enhance the ‘mix’ by adding filters, equalization, effects, adjusting individual levels and recording mixes. The more individual tracks you record and mix simultaneously, means you’ll need a bigger mixing board. This is why traditional recording studios have such big mixers, taking up nearly the whole room, eventually coining the term ‘mixing console’. Today, in our modern recording studios, the audio interface takes up the job of multitrack recording and the computer takes up the job of editing, mixing and mastering. The audio mixer then only fits in, if you’d like a board to route audio to different monitors or once in awhile, plug in an input or two. There are audio mixers that come with a built-in audio interface as well, like the Zoom LiveTrak L-12, which might appeal for home producers who’d like the idea of having physical faders to play with. However if I’d give advise, it’s often better to buy a specialized audio device rather than buying a 2 in 1 device. The Mackie ProFx12 is a nice analog mixer that will do for most of your audio routing needs. They cost much less than their digital counterparts and many analogue mixers still find a place in modern recording studios. There’s nothing much you could do with a small to mid-size analog mixer than routing audio around and occasionally adding filters and effects. Get an analog mixer if you just want to route audio to a set of speakers, occasionally plug in a few inputs and do most of your arranging, recording & producing on your computer. The Presonus StudioLive 16 allows you to record wireless with an app too! Prior to popular belief, digital is not better. As you input audio into a digital mixer, there is ADC (Analog to Digital Converter) that converts analog audio to digital audio. Much like how an audio interface works, to be exact. But on digital mixers, you have LEDs, digital effects and sometimes even motorized faders (which can be mapped to your DAW). Think of digital mixers as mixers with computers built in them – enabling you to route audio, put effects, equalize and sum audio digitally. Get a digital mixer if you like the idea of using real faders and knobs to record & mix your music. Also, not that digital mixers usually cost more than their analog brothers. It’s amazing what producers can do these days, arm with just a laptop and a bunch of samples. Again you probably don’t need to go on a shopping spree as you’re starting out. Your DAW, out of the box should have enough samples, loops and instruments for you to experiment and compose on. But, as you progress, you’ll begin to outgrow them and will start looking for more virtual instruments, VSTs or samples – to expand your soundscape. Native Instruments Komplete – Somewhat of an ‘industry standard’, Komplete is the most well-rounded VST instrument, sound library and samples you can buy – no matter the genre of music you produce. EastWest – Used by industry professionals, EastWest instrument samplers don’t come cheap, but they are good. There’s also a cloud service that allows you to rent their libraries before buying anything outright. Serum by Xfer – It’s hard to come by electronic musicians who don’t have Serum installed in their DAW. Loopmasters – I normally collect audio samples and loops from magazines, but if you’re looking for specific samples. About The Author: Lance Waterly is a professional audio engineer and full-time audio hobbyist. He has worked on everything from home studios to marine audio equipment, and is always chasing that perfect sound.